On Saturday I attended a course on Grasshoppers, Crickets and Allied Insects. Allied insects covers groundhoppers, our native cockroaches and the earwigs. So what did I learn? In the UK there appear to be eleven grasshoppers, about fourteen crickets, four true crickets and three groundhoppers, all of which can be identified in the field or from photographs and then keyed out. So for once there isn’t really any need to collect specimens, particularly as most will lose their colour after death anyway. Three of the crickets, the Field Cricket, the Mole Cricket and the fabulously named Wartbiter are protected under the 1981 Wildlife and Countryside Act and so cannot even be handled without a licence from Natural England. Apparently even taking photographs of them is discouraged as this could be interpreted as interference. To keep my hand in, on Sunday I went looking for the aforementioned Orthoptera up on Morgan’s Hill. As usual I got rather distracted. Well it was warm and sunny and in amongst the brambles Speckled Wood and intense orange Comma butterflies were feasting on the ripe blackberries which gave me perhaps my last opportunity this year to take some photographs before Autumn’s chill puts them to sleep. When I did finally apply myself I found four species. A male and female Meadow Grasshopper, a male Field Grasshopper, a female Roesel’s Bush Cricket and the female Dark Bush Cricket Pholidoptera griseoaptera pictured above. As you can see female bush crickets have a large sickle-shaped ovipositor which is used for egg-laying. Eggs are laid in soil or rotting wood and the nymphs go through seven stages (instars) over a two year period before reaching sexual maturity. 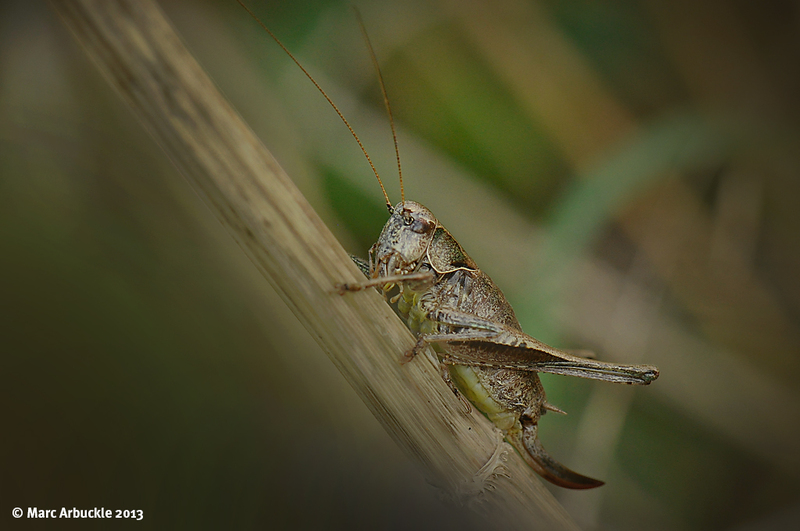 Unlike grasshoppers which are vegetarians, crickets are omnivorous, feeding on small insects like aphids, but they will eat nettle, dandelion and bramble leaves. If you are collecting a few samples for observation be careful about putting them in together as they are cannabalistic and will bite chunks out of each other and… if you do not handle them carefully aren’t above giving you a little nip.